When Dracula meets Frankie, they decide to create a school. But recruiting students always comes with its trials and tribulations. Not everyone is a fan of change. So a lot of bad ratings come in. But it is also a reboot, so of course there is going to be a lot in difference. Of course having a 10 year old, I've seen so much of the older Monster Highs. But I like that they give it a new light and story. And it isn't an "old" series. Shows and movies get changed around an awful lot. I loved the graphics better, the voice acting, and storytelling. I was skeptical at first watching it,but I really enjoyed it, by surprise. A new animation style is used for this movie. 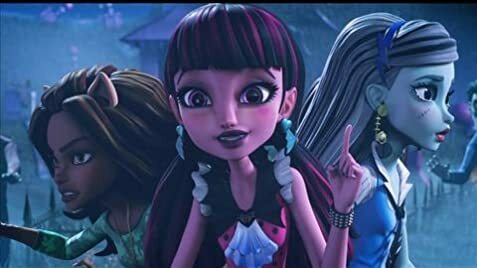 This means that the Monster High movie series has used three animation styles so far.